Thread: Is Bay Ridge really an interesting neighborhood? Last edited by ironmike9110; March 24th, 2008 at 11:26 PM. Last edited by OmegaNYC; September 21st, 2006 at 03:58 PM. Rossi’s store was at the heart of a major steroid investigation. Last May, more than $100,000 in steroids shipped from China were seized. According to theNY Times, a bigger raid in September seized nearly $8 million worth of human growth hormone and anabolic steroids. LOWEN’S PHARMACY, at the corner of Bay Ridge Avenue and Third Avenue in Bay Ridge, Brooklyn, since 1953, was open for business last week, with a Valentine’s Day display in the window next to an old newspaper article, blown up to poster size, hailing the store as a “beacon of service.” With the text was a picture of John Rossi, the store’s gray-haired owner, wearing glasses and a serious look, and filling a prescription. News coverage has been less kind in recent months, ever since police raids in May and September in which the authorities said they had seized millions of dollars’ worth of steroids and human growth hormone. On Monday, as a wide-ranging investigation continued, Mr. Rossi was found dead in an upstairs office, apparently a suicide. On Wednesday, a day after the television news cameras had left, all of Bay Ridge seemed to pause in front of the store to gawk or pay respects. A little after noon, a man in his 50s who was carrying two grocery bags stopped by the flowers and looked up, then crossed himself and pointed to the sky before continuing on his way. People recalled Mr. Rossi’s days at the store from the early 1970s, when he was fresh out of pharmacy school, to the time, years later, when he finally bought the business from its original owner. They described him as friendly and inquisitive, and always patient in answering questions about dosage or side effects. He was not exactly outgoing, but he was someone regular customers were used to seeing and knew they could trust. Walter Toro, a neighbor of the store who stopped to read the notes, remembered how widely respected Mr. Rossi was, and the shock that came with the first news about steroids. “I saw it on TV and said, ‘Is that the same drugstore?’ ” he said. According to people in the neighborhood, however, the investigation and the ensuing publicity had not seemed to hurt business. Lorraine Daly, who grew up nearby and got to know Mr. Rossi when her brother had a long illness, remained a regular customer. She saw Mr. Rossi the day before his death, when she was picking up a prescription, Ms. Daly said. But she was in a hurry, so she just said hello and rushed out. The medical examiner’s office ruled that Mr. Rossi shot himself, once in the chest and once in the head, but Ms. Daly was not alone in wondering whether someone else, perhaps because of the drug investigation, wanted him out of the way. Last week, most longtime customers preferred not to dwell on the details. “He was always a gentleman,” said Anita Banach, a regular customer who lives in Bay Ridge Towers, a few blocks north of the store. 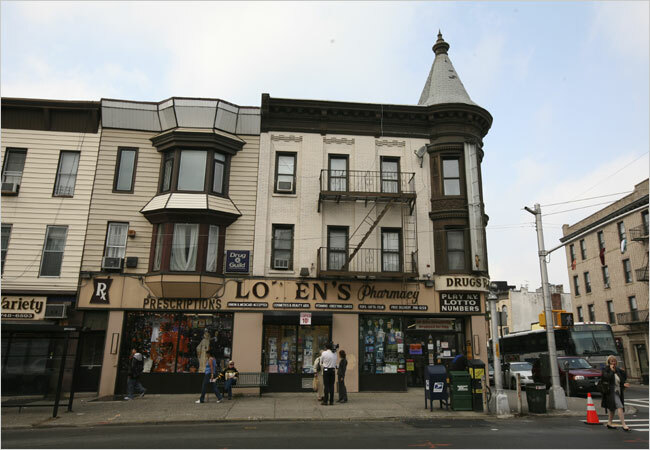 In August, a freakish tornado that tore through Bay Ridge had damaged the Lowen’s sign, and only about a week or two ago Ms. Banach saw Mr. Rossi outside his pharmacy, supervising the installation of a new one. Wednesday afternoon, a gust of wind tipped over one of the bouquets standing in front of the store. Wordlessly, a woman wearing headphones and a hooded sweatshirt who was walking by stopped and set it upright. I know, i know...i post alot. But i am learning. ANyways, i made a post not too long ago about moving to an exciting neighborhood that is safe yet still interesting. People reccomended to not go into bensonhurst because "its not the most exicitng place in the world" but said bay ridge would fit my taste. But i read on wikipedia that most of Bay Ridge's residents are over 60! Downtown Brooklyn is the place to moce. Around Court St. you have all these new business' and it is like a mini Manhattan. In the summer everyone is outside and it has young residents and a hip crowd. Check it out. Whereabouts on Court Street? I'm curious to know as I'm starting work in Manhattan late August and am looking to live in Brooklyn. Thanks! It is a bit past Court and Douglas. If you look up the restaurant Blue Ribbon, that is a great neighborhood. Also by Douglas like I stated before...I THINK it is by Union st. I will ask and report back. NEW YORK (eTN) - With a thriving arts community, diverse ethnic enclaves and some of the City's most distinct shopping and dining experiences, Brooklyn's Williamsburg neighborhood has in recent years become one of New York City's hippest areas. And with its easy accessibility -- just a short ride on the L train from Manhattan's Union Square -- Williamsburg also stands apart as an ideal destination for visitors looking to explore another side of the City. "Williamsburg is a haven for the young and the hip," said George Fertitta, CEO of NYC & Company, the City's official marketing and tourism organization. "It is also a draw for domestic and international visitors who are seeking to discover neighborhoods with new dining and culture options." In addition to the L train, visitors can take the J, M, Z lines from Manhattan. Those who do take the L, however, will find themselves just a short walk from the Lorimer Street station to the neighborhood's first hotel, the newly opened 54-room Hotel Le Jolie. Sixteen of the hotel's rooms offer stunning views of the Manhattan skyline. A choice of king, queen or double twin beds is available, and the hotel offers added pluses like 42-inch, flat- screen televisions, a 24-hour business center, free continental breakfast and minibars. The hotel is an economical choice, with room rates that are under $200, a rare find in New York City (235 Meeker Avenue, hotellejolie.com). Close by is the hip and cozy Roebling Tea Room, offering coffee, spirits and great food. Located at 143 Roebling Street, the entrance is on Metropolitan Avenue. Relax on one of the comfortable sofas or sit at the long bar and sample some of the delicious fare (roeblingtearoom.com). Just outside Roebling Tea Room is the hip Boundless Studio, located in the same building, which touts itself as a "melting pot of media, music and clothing." From accessories to footwear, outerwear, hats, tees and tops, this stylish boutique has plenty for the adventurous shopper (boundlessny.com). Walking down Metropolitan Avenue heading toward the Manhattan skyline, you will eventually hit Bedford Avenue, where visitors will find some of the City's hippest boutiques, coffeehouses and food and wine shops. Not far away is Pema New York, at 225 Bedford Avenue. Consisting of hand- knit wool accessories and hemp wear for men and women, the merchandise is designed by Migmar Tsering. Select designer collections in apparel, jewelry, leather goods and footwear are also part of the offerings (pemany.com). Just next door sits the Bedford Cheese Shop. Located at 229 Bedford Avenue, at North 4th Street, the meticulously kept gourmet shop offers more than just cheese from around the world. There's also finds like Sag Harbor sea salts, New York State maple syrup and fresh mozzarella. The shop has an old-fashioned feel, and offers a cheese plate of the day and a sandwich of the day (bedfordcheeseshop.com). Close by is the Brooklyn Brewery, located at 79 North 11th Street. Situated right in the heart of Williamsburg, the brewery offers tours every Saturday at 1, 2, 3 and 4pm. No reservations are required. Happy hour is offered every Friday from 6-11pm (brooklynbrewery.com). More good beer can be found at Mugs Ale House, located at 125 Bedford Avenue. Known as the "Cheers" of Williamsburg, this popular spot is considered one of the best beer joints in New York City (mugsalehouse.com). For good wine, try D.O.C. Wine Bar, located at 83 North 7th Street. The rustic Williamsburg enoteca with a Sardinian slant offers delicious cheeses, wines and panini near the waterfront (docwinebar.com). Located at 331 Bedford Avenue is PT Restaurant, an intimate Italian eatery with a Japanese influence. Diners can relax in a cozy, rustic and industrial atmosphere. During the warmer months, don't miss the gorgeous garden (ptbrooklyn.com). For those seeking a trendy atmosphere and delicious food, try Diner, located on the South Side of Williamsburg at 85 Broadway, one block from the Williamsburg Bridge. Located inside a 1920s Kullman Diner, the eatery serves lunch, dinner and brunch, as well as a full bar (dinernyc.com). My Moon, a Mediterranean eatery built in the old boiler room of a warehouse, features indoor and outdoor seating and large art space that changes every few months. Located at 184 North 10th Street between Bedford and Driggs Avenues, the romantic restaurant has been referred to by Zagat as Williamsburg's "best place for a first date" (mymoonnyc.com). For those who want a seriously good meal, try the world-renowned Peter Luger Steakhouse. Serving the finest USDA Prime steaks since 1887, the restaurant is located at 178 Broadway (peterluger.com). I grew up in Brooklyn. Many good memories. I really loved to see the Jewish celebrations although they are very closed community. Still miss the smells of the market. I think you will like it . Wens aka Spinner the fitness junkie. Last edited by Wens; June 19th, 2008 at 07:02 AM.